The college graduation rate among Grand Rapids Public School students remains low. T2C Studio aims to increase postsecondary education attainment in West Michigan. As new funding becomes available, a countywide expansion of the initiative could be possible. There is never a quiet moment in T2C Studio. The sound of laughter, flipping notebook pages, and chatter constantly echoes across the glass panels ringing around this brightly colored, open-aired space in the main branch of the Grand Rapids Public Library. The hustle and bustle is bound to grow. With the recent announcement of a $150,000 Wege Foundation grant award, T2C Studio will soon expand its college readiness services. In November 2016, the To College Through College (T2C) initiative kicked off with a special celebration hosted by Mayor Rosalynn Bliss. The launch took place as part of a five-year pilot facilitated by Our Community’s Children, an office within the City of Grand Rapids that provides programming to young people. 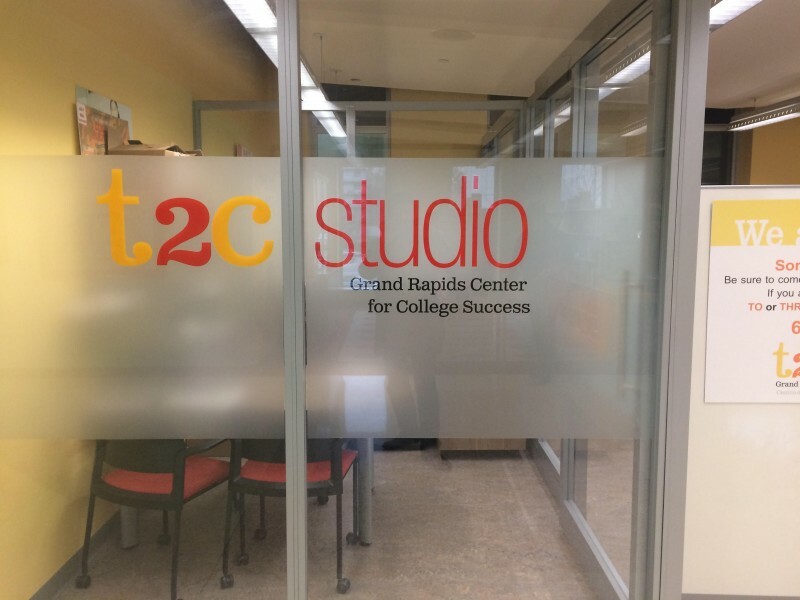 T2C Studio aims to increase postsecondary education attainment in West Michigan. Available services include assistance with college selection, college applications, and federal student aid. More than 1,500 Grand Rapids Public Schools (GRPS) students have been served by the T2C Studio since its opening. Of those participants, approximately 75% identify as people of color and 60% identify as first generation college students. Many GRPS students struggle to find success in college. While 60% of GRPS students attend college, only 18% of them graduate with a degree. Uncertainty and confusion marks the experience of those entering college without clear personal or professional goals. The process of choosing a major, signing up for classes, and finding internships can be overwhelming without a support structure in place. Financial issues add to the challenge of navigating the higher education system. Natasha Nash, a student at Grand Rapids Community College, cleans at a local school for thirty hours per week. Part-time work helps Nash make tuition and rent payments, but it also makes it difficult to find time to study. The pressure to graduate intensifies for first generation students, who carry the weight of high expectations. Nash worries that if she does not perform well in her business and criminal justice program she will disappoint her relatives. Shayla Young, the T2C Studio Coordinator, hopes that she can help students like Nash overcome the same challenges she faced. As a GRPS graduate and first generation college student, Young applied for a Millennium Gates Scholarship that paid for her undergraduate degree at Ohio State University and doctorate from Michigan State University. No two new days are alike for Young. She prepares for college workshops, maintains a text message system, and reviews scholarship applications, all while fielding questions from student drop-ins. One of Young’s goals is to empower students to take charge of their own future. Young recalls a young man, who dropped into T2C studio in hopes of finding a job. He assumed that the only thing he could do after graduating high school was to secure employment, but Young encouraged him to consider college, and eventually, he decided to attend Ferris State University. As more new students join the program, Young emphasizes the need for greater retention. This would involve deepening relationships with nine college partners. The future of T2C Studio looks bright as additional funding could enable a countywide expansion. Satellite locations could spring up in towns and cities across Kent County, while new connections are made with local businesses in burgeoning industries.